Ainternationally renowned classical dancer and choreographer, has trained extensively in three distinct dance styles of India – Bharatanatyam, Kathak and Manipuri – under the most important teachers of the twentieth century. His Kathak training was under Pandit Mahadev Kathak for six years and Manipuri under Mrs. Aruna Gandhi for two years. Khendry’s Bharatanatyam started in 1955 in Chidambaram and later in Kattumanarkoil in South India under Guru Swami Muttukumar Pillia of Tiravallur tradition for two and a half years, which was continued in Hyderabad with Mr. T.K. Narayan for four years from 1957 to 1961. In 1968 he met Mr. and Mrs. U. S. Krishna Rao of Bangalore, in New York City, who have given him the best of the Pandanallur tradition for the next thirty years. Guru Kittapa of Tanjauvar tradition and Mrs. Kalanidhi Narayanan of Madras, further enriched his impeccable training during their visits to Toronto. 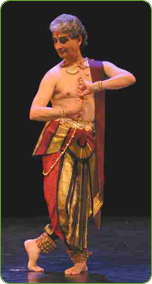 During a very distinguished dance career which spans over forty-five years, Khendry has given more than a thousand performances in different parts of the world, and has given five command performances for two past Presidents of India, Dr. Rajendra Prasad and Dr. S. Radhakrishnan. In 1965 he was commissioned by the Educational Channel 13 in New York City to create thirteen works based on “Fables and Legends of India”. In 1978 he was invited by the Allentown Museum, Pennsylvania to be the Guest Curator for a special exhibition “The Sensuous Line” and was commissioned to create two works based of “The Sensuous Line” relating to dance sculpture and painting. In 1994 he was commissioned by the Los Angeles County Museum of Art to create a work “The MONK, The COURTESAN and The CHARIOTEER” for a special exhibition “PEACEFUL LIBERATORS”. The work was also presented at the Kimble Art Museum and the New Orleans Museum of Art, where the exhibition traveled. This work has also been performed in fourteen other cities in Canada, the United States and Singapore. He has been invited by major museums and universities in the United States and Canada to perform, lecture and conduct workshops. For seven years he was a member of the South East-Asian Study Seminar Group at the Columbia University in New York City where he presented several papers on Indian art, music and dance. Khendry’s forte is in choreographing works based on very rare philosophical subjects that have never been attempted as dance works, blending several different Indian classical dance styles and creating a new and powerful dance vocabulary. His -professional choreographic career started in 1961 when he was invited to co-choreograph a dance drama BASANT for Tagore’s centenary celebrations. In New York City he choreographed full length works, SHYAMA in 1965, DANCE of SHIVA based on Kalidas’s KUMARSAMBHAVAM in 1969. SURYA and MOODS of the RHYTHMS, were created in 1995 in Toronto. In 1997 after three years of extensive research he created and presented PANCHAKALYANAKA from the LIFE of MAHAVIRA with twelve dancers of four different dance disciplines. In 1998 he realized his life’s dream and presented GAYATRI. MEGHADUTTAM was also created in 1998. In 1999, SOUNDS of the HILLS and in 2000 WOMEN LIBERATED were created and presented. In 2004, after four and a half years of research, Khendry presented UPANISHAD. When Khendry is not working on his creative works, he is constantly choreographing the traditional Bharatanatyam repertoire for the JANAK KHENDRY DANCE COMPANY. The Company has more than one hundred and twenty-five works in its active repertoire. The strength of Khendry’s creative works lies in extensive scholarly research. He works with several eminent scholars in the field. With the passage of time Khendry’s works are becoming deeper in their philosophical approach, immersed with human concerns and understanding. His recent works have stressed the messages of Non-violence, Self-discipline, Human-equality and Peace. Currently, Khendry is developing four new works, PANCHAGNI to be presented in February of 2006 and DREAM OF A DRUNKEN GOD, AGNI AND INDRA and CHANDRA KAUNS to be presented in the fall of 2006.
n;" id="_mcePaste">Khendry is recipient of several very prestigious grants and awards: Nizam's Grant and Sangeet Natak Akademi Award in India. In Canada he has received Toronto Arts Council; Ontario Arts Council; Laidlaw Foundation; Ministry of Culture, Citizenship and Recreation, The Canada Council for the Arts and Canada's Year of Asia Pacific grants. An internationally renowned classical dancer and choreographer, Janak Khendry has trained extensively in four distinct dance styles of India: Bharatanatyam, Khatak, Sattriya and Manipuri. Khendry’s Bharatanatyam training for more than thirty-five years started in 1955 in Chidambaram, a city famous for its Nataraja Temple in South India, and Kattumanarkoil a small village in South India with Guru Swami Muttukumar Pillia. Khendry also studied Modern Dance at the Ohio State University for two years with an emphasis on Graham, Limon and Cunningham techniques and was a recipient of a scholarship from the prestigious Julliard School of Music and Dance in New York City. He moved to Canada in 1979. Khendry’s very distinguished dance career spans over fifty-five years and has given more than a thousand performances in different parts of the world. He was invited to give five command performances for two past Presidents of India, Dr. Rajendra Prasad and Dr. S. Radhakrishnan in India, and for the Vice-President of the United States, Mr. Hubert Humphrey, in Washington, D.C. at the inauguration of CARE and MEDICARE projects. He was one of the five artists invited from across the United States. He has been invited by major museums and universities in the United States to perform, lecture and conduct workshops and has performed very extensively in India, the USA, Canada, Mexico, South Africa and South East Asia. In 1978 Khendry was invited by the Allentown Museum of Art to be the Guest Curator for a special exhibition The Sensuous Line and create two dance works based on that theme. In 1994 he was commissioned by the Los Angeles County Museum of Art to choreograph and present The Monk, The Courtesan and The Charioteer, which has been performed in five countries. Khendry’s professional choreographic career started as early as 1961 in Hyderabad, India. In 1965, he was invited by the Educational Television Channel 13 in New York City to choreograph thirteen programmes, “FABLES and LEGENDS of INDIA.” Some of the major created works are BASANT, SHAYAMA, KUMAR SAMBHAVAM, MEGHDUTT, SURYA, MOODS of the RHYTHMS, PANCHAKALYANAKA from the life of MAHAVIRA, SOUND of the HILLS, THE GODS ARE DANCING and WOMEN LIBERATED. In 1998 he realized his life’s dream to choreograph and present GAYATRI, a one-hour-and-fifteen minute work with four dancers. 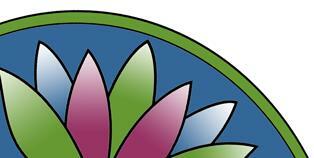 This work was sponsored by the Centre for South Asian Studies, University of Toronto. In 2004, after four-and-a-half years of research, Khendry presented UPANISHAD, a two-and-a-half hour work with fourteen dancers of several disciplines. 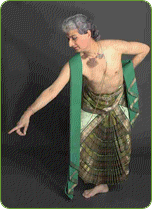 UPANISHAD was the most important work of Khendry’s dance career to date. In 2006, Khendry created two new works: CHANDRAKAUNS and DREAM of a DRUNKEN GOD. Since 2009 he has created GANGA, KAAL-TIME, PARADISE LOST and LIFE ETERNAL. Khendry is a recipient of several very prestigious Grants and Awards: The Nizam’s Trust Grant, India; Sangeet Natak Akademi, India; Toronto Arts Council, Ontario Arts Council, The Canada Council For the Arts, Toronto Metropolitan Cultural Affairs, Laidlaw Foundation, Ministry of Culture, Citizenship and Recreation, Canada’s Year of Asia Pacific and The Yehan Numata Programme in Buddhist Studies, University of Toronto. Khendry was a member of the South East-Asian Studies Seminar Group, Columbia University, New York City, for seven years where he presented several papers on Indian Art. During his eighteen years stay in the United States, he lectured on Indian Art and Aesthetics at several major universities. Because of his highly scholarly and philosophical approach to his creative works, Khendry has a high profile with museums and academic institutions. Khendry has a Master’s Degree in sculpture from Ohio State University. He has had eight solo sculpture exhibitions and his works are in private collections in India, USA, Canada and Europe. Khendry’s other fields of specialization are Indian and Italian Renaissance’s art history. In 2011 Khendry was part of the power list of thirty most important Indo-Canadians - presented by INDIA ABROAD.